We know this because the cranes have arrived at the old Sahara as it is transformed into the SLS hotel. Barely a week after covering their busted electronic marquee with a tarp touting the coming SLS, the camels and Sahara signage have been removed from the property. Tons of photos of this morning's removal via Las Vegas Sun. photo on the SLS facebook page show additional damage being done. I only saw it once, about 2-3 years ago, but I liked the Sahara (OK, maybe not the clientele or the section with its NASCAR theming) for its vintage vibe. SLS better be amazing. I was last there in 2008 and it was a raging shithole. I still remember the $3 beer-stained and cigarette-burned blackjack table that smelled like vomit, and the toothless dealer to go with it. I get nostalgia, but this was a place that needed to be put out of its misery. I'm wondering if Nazarian's ego is getting ahead of himself, and he thinks the SLS brand and formula alone is enough to draw crowds and sustain the Vegas property. Vegas is a different beast than Miami, LA, NY, etc. A "scene" alone might work elsewhere, because the scale is smaller, and the hotels themselves are only compliments to the greater destination. Vegas is just a whole different scale. There's a reason you don't see a "W" on the strip. Plus, unlike other SLS outposts, the Vegas property does not have the benefit of a prime location. The people that stay at SLS in Los Angeles, stay at Wynn, Cosmo, etc. in Vegas. The scale of nightlife down the strip is only getting bigger, and SLS will certainly be a very small fish with their current funding and plans. With seemingly half of Vegas already firmly chasing the 21-35 young money party demographic, most of whom already have established and gigantic nightlife operations, with more in the pipeline, I just don't see much of a reason for people to take much interest in SLS, even if they are familiar with the brand. wondering? alalahahallalalh allahall ahaha ahahahaha HHAHAHAHAHAHAH! ^^ This made me laugh so hard I almost convinced myself SBE was relevant outside of Los Angeles. I call massive fail. The place will never draw that much of a crowd. I went into the Sahara just once and once was enough. The place smelled like one of Elvis' jumpsuits died in it and the clientele came off like a bunch of extras in the Walking Dead. I am happy they are proceeding with redevelopment, given I think most of us thought this wouldn't happen, it's a credit to them, although I think we know that it's going to have it's challenges in making it work, but a redeveloped property will be nice for someone else to come in and scoop up on the cheap, which as a Vegas fan, I'm happy about potentially having an option down the line with a new operator. In 1985 I am told we stayed here for a night on our way to Disneyland. There are no photos of us being at Sahara, and I do not remember it at all, but deep in the archives of my hard drive is a memory of sleeping in a hotel room that I kept imagining must have been built in my mom's ashtray - it must be the Sahara. 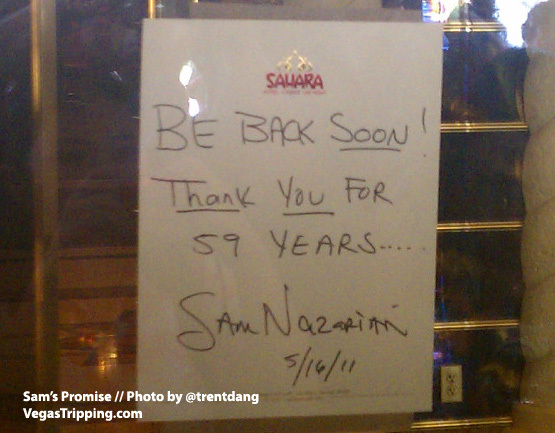 I stayed at the Sahara four months before it closed..it was what it was at the time--a property that was in its death spiral..but the staff at the time was polite, helpful, friendly and was generally a cool bunch of folks.. I always tried to take a lap around the place whenever I was in Vegas..if you went at night, it felt like a pretty major party was taking place..and it was really the only place on the Strip that celebrated its past, and didn't apologize for it. For a while, one it opens, its going to be newest place on the Strip, and I'll go down and take a look...given its proximity to the former Echelon, it may have life yet..